Distinctive design is the key focus and crux of a successful product. Airwheel S3 as the latest groundbreaking hit on market has redefined industry standard with its innovative interplay of distinctive design elements. Let’s take a look at the newly launched electric scooter. According to official specs, Airwheel S3 can cover a range up to 65km. As a volunteer tester, I didn’t ride that long, however the moment when I stepped on and held on to its control shaft, I felt as great as I was driving a top-geared car. It travelled faster than average unicycles and conducted more agile turning motion without much change of your body movements. Based on the latest gyro-system, it just runs smoothly with cool zooming sound, like an electric car. Powered by a latest magnetic levitation motor, steering experience on S3 is solid and stable. In addition, S3 is controlled by a leading chip which minimizes latency. Another mostly raised concern is the comfort: unlike unicycles, riders don’t have to straddle and press legs against the unit to control it. Instead, they just stand relaxed on the widened platform and control S3 by moving the handlebar, which ensures the comfort even after travelling a long distance. I’ve also tried the remote key in the test drive, which could turn on and off the unit remotely as remote car keys. Thanks to the magnified LED indication panel, you’ll get a clear idea of the real-time speed, mileage, battery level and temperature, which is very handy and helpful. Moreover, compared with similar products, S3 makes a difference by integrating Bluetooth function, which allows you play songs in your smart phone on its dual bass speakers when connected. Enjoy your tuned trip! Safety goes first. Airwheel S3 comes with same safety protection measures as other Airwheel products, e.g. Low Battery Protection and Tilting Protection, which assists starters in controlling the speed and better coordinating with the unit. The self-balance unicycle is designed to be low-profile sportive for everyone’s daily commute. 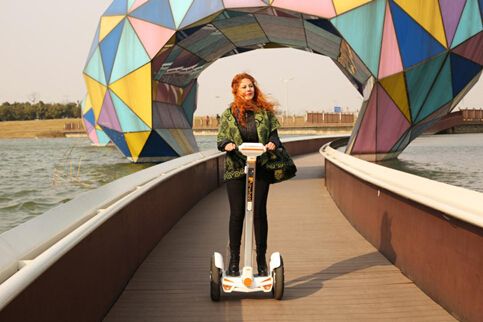 With the prevailing “Go Green” campaign and electric car industry, Airwheel S3 stages as a perfect eco-friendly option for average customers with limited budgets. As for the steering experience, you’ll have your own judgement after laying feet on it. In summary, Airwheel S3 redefines future transporter with high-end configuration and quality at low-end price. Tesla and Segway can cost you an arm and a leg? Go get an Airwheel S3!